Movie goers in Concord were a bit shaken Sunday night after a man was shot by a security guard outside a movie theater, prompting an evacuation. Officers responded to the Brenden Theatres at 1985 Willow Pass Road about 6:50 p.m. on reports of gunshots and one person shot, police said. One person was arrested. Concord police later discovered the shooter was a security guard, and the incident began with a disturbance inside the theater building. They said a man threatened the security guard, saying he had a gun and would shoot him. The suspect who was shot was transported to a hospital. Police said his injuries do not appear to be life-threatening. No gun was found on the suspect. 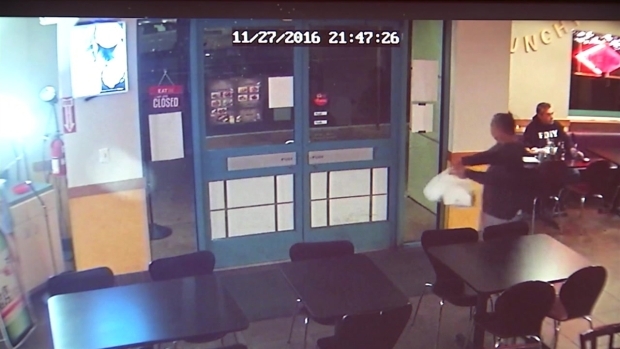 Surveillance video from inside a nearby restaurant when a shooting occurred outside the Concord theater. The theater was evacuated as a precaution, police said. Those in attendance said the manager walked into the theater not long after they sat down. "He turned the lights on and made a calm announcement that the police need us to leave," said Amy Eikner of Concord. Theater patron Julie Graham added: "It was a little scary at first when we got out to the lobby; there was absolutely no one there." One witness described hearing two or three shots and feeling a bit frightened. “I was watching a movie, just chilling, and I heard shots, and I’m thinking I’m at the movies and I didn’t think much of it," evacuee Jowar Basulto said. "And then I heard screaming, and I got scared and started running out. I got out, and I saw all the cops, and it wasn’t until I got out that I found out somebody got shot." The identites of the suspect and the security guard were not available. No other injuries were reported. The shooting was still under investigation late Sunday night.